Though it seems like mere days since the Regina Pats were playing host to the 100th Memorial Cup back in May, here we are once again with September coming to a close and another year of WHL hockey upon us. Each year with the changing of the seasons comes a changing of the guard in the WHL. Veteran faces have graduated on to the professional ranks or moved into the Canadian University system as they access their WHL Scholarship and play U Sports hockey. 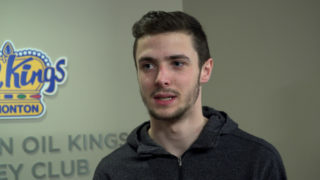 With their departures come exciting new arrivals as a fresh-faced new crop of enthusiastic youngsters, full of unbridled ambition, strive to establish themselves as the next generation of WHL superstar. With one week of the 2018-19 WHL season in the books, there has been plenty of change across the region. From longstanding streaks broken to new rookies making a splash – in goal creases, on the scoresheet and behind the bench – change has been seen in great detail across the provinces of B.C., Alberta, Saskatchewan, Manitoba and the U.S. Pacific Northwest since the puck dropped on Friday, September 21. 1. 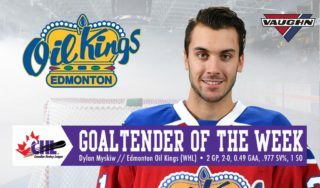 In the 52-year history of the Brandon Wheat Kings, never has an import goaltender suited up, let alone win a game. That all changed Friday night as Vegas Golden Knights prospect Jiri Patera, a product of Prague, Czech Republic, posted 28 stops on 29 shots to backstop the Wheat Kings to a 2-1 victory over the visiting Moose Jaw Warriors. A second round selection (104th) at the 2018 CHL Import Draft, Patera went on to make another 28 saves Saturday night, helping the Wheat Kings to a 4-2 triumph and a 2-0-0-0 start to the campaign. 2. Through the first seven days of the 2018-19 WHL season, goal scoring is down from one year ago. From Friday, September 21 through Wednesday, September 26, 2018, WHL Clubs have played a grand total of 22 games and scored 121 goals for an average of 5.50 goals per game. During the same period – Friday, September 22 through Wednesday, September 28, 2017 – a total of 21 games were played, with 145 goals scored for an average of 6.90 goals per game. I don’t necessarily think there is reason for concern. 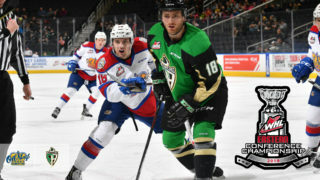 There were still plenty of high-scoring contests, including the Prince Albert Raiders knocking off the Regina Pats by a 7-2 margin and the Saskatoon Blades blanking the Swift Current Broncos by an 8-0 tally. 3. 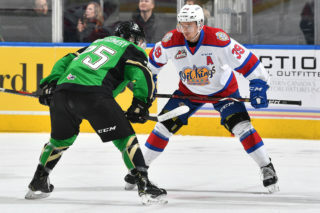 Through the first seven days of the 2018-19 WHL season, the Edmonton Oil Kings sit perched atop the league charts, having registered a perfect 3-0-0-0 record while outscoring opponents by a combined 11-5 margin. The quick start out of the gate marks a promising sign of things to come for an organization that overhauled its hockey operations department this summer, with WHL Alumni Kirt Hill taking the reins as President of Hockey Operations and General Manager before installing Brad Lauer as head coach, Luke Pierce as assistant coach and Jamie Porter as director of scouting. In 2017-18, the Oil Kings were 1-2-0-0 through three games while being outscored 18-13 along the way. 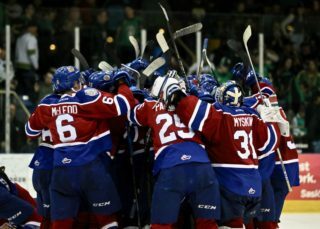 When the season finally came to a close, the Oil Kings were in the basement of the WHL with a record of 22-42-6-2 and 52 points. While it remains early in the campaign, there is plenty to like about the turnaround in the City of Champions. 4. Having not qualified for the WHL Playoffs since 2013, the Saskatoon Blades have many pieces in place to end that drought in 2019. The Blades got off to a 2-0-0-0 start to open the 2018-19 WHL campaign, powered by 2019 NHL Draft prospects Kirby Dach and Nolan Maier. Up front, Dach rattled off seven points (3G-4A) in two games to earn WHL ‘On the Run’ and CHL Player of the Week honours. The product of Fort Saskatchewan, Alta. leads the entire WHL in scoring through the opening week of the 2018-19 regular season. Between the pipes, Maier scored two victories and one shutout, logging a 0.50 goals-against average and .970 save percentage. He leads the league in each of those major goaltending categories to this point in opening week. Both played significant roles for Canada’s gold-medal effort at the 2018 Hlinka Gretzky Cup. Should they continue to contribute as they did on opening weekend, a return to playoffs seems nothing short of certain in Saskatoon. 2019 #NHLDraft prospect Kirby Dach of the @BladesHockey has been named the CHL Player of the Week! 5. After being a waiver wire afterthought at the 2018 WHL Trade Deadline, Calgary Hitmen defenceman Egor Zamula is coming into his own, and it isn’t just folks out west taking note. Zamula, an 18-year-old defenceman from Chelyabinsk, Russia, was invited to training camp with the NHL’s Philadelphia Flyers who promptly signed the 6-foot-3 tower to a three-year, entry-level contract. The rangy blueliner was originally selected by the Regina Pats in the first round (60th) of the 2017 CHL Import Draft. After the Pats went out and added the veteran presence of import defenceman Libor Hajek, there simply wasn’t room for Zamula as Finnish forward Emil Oksanen remained an offensive contributor up front. Ever savvy veteran general manager Jeff Chynoweth scooped Zamula off the wire and the rest is history. In 31 games in Calgary last season, Zamula registered 11 points (2G-9A) and a plus-1 rating with a Hitmen squad that missed out on post-season action. 6. The Prince George Cougars snapped a six-game winless streak at Prospera Place in Kelowna with a 4-2 win over the Rockets Wednesday night. The last Cougars win in Kelowna came back on Tuesday, November 15, 2016, as 1996-born Colby McAuley registered two goals and three points in – you guessed it – a 4-2 win over the Rockets. 7. The Kamloops Blazers joined the Cougars in halting a lengthy regular season winless skid in Kelowna when they collected a 3-1 victory over the Rockets at Prospera Place on Saturday. The Blazers were winless in four straight regular season games in Kelowna. To find the last Blazers regular season win in Kelowna, one has to wind back to January 27, 2017, when Kamloops edged the Rockets by a 3-2 margin courtesy two goals from 1997-born Rudolfs Balcers and 30 stops from goaltender Connor Ingram. Yes, it is early, but are fans witnessing a changing of the guard in the B.C. Division? 8. 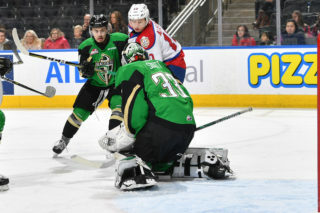 Speaking of lengthy streak snapping, the Prince Albert Raiders were winless in 15 straight games against the Regina Pats heading into the 2018-19 WHL season. That ended in a big way on Friday night as the Raiders thumped the Pats by a 7-2 tally with three goals provided by Yorkton, Sask. product Carson Miller. The last time the Raiders beat the Pats was on opening night of the 2016-17 WHL Regular Season. On Friday, September 23, it was 1997-born Czech import Simon Stransky provided two goals and three points to help the Raiders claim a 4-3 overtime victory against the Pats at the Brandt Centre in Regina. 9. A total of 19 of 22 players selected during the first round of the 2017 WHL Bantam Draft made opening day rosters to start the 2018-19 WHL Regular Season. Of those, 17 skated in games over the weekend with only Saskatoon Blades forward Kyle Crnkovic and Vancouver Giants defenceman Joel Sexsmith not dressing due to injury. 10. Of the 121 goals scored since the 2018-19 WHL Regular Season began, 14 served as career firsts – good enough for 11.6 per cent of all goals scored through Wednesday, September 26. Both games on Wednesday’s schedule saw WHL firsts as defenceman Eric Van Impe of the Medicine Hat Tigers and import defenceman Lassi Thomson of the Kelowna Rockets registered their milestone markers. Memorable moments from first goals to wins feature in early #WHLOpeningWeek action. 11. In addition to first goals, four WHL head coaches registered their first career WHL victories over the weekend. Edmonton Oil Kings head coach Brad Lauer notched his first career WHL victory after nine seasons as an NHL assistant coach. The milestone win came Friday night in a 4-2 triumph over the Red Deer Rebels. Kamloops Blazers head coach Serge Lajoie secured his first WHL coaching win on home ice Friday night as his Club defeated the Kelowna Rockets by a 4-1 spread. Lajoie had spent the previous three seasons as head coach of the University of Alberta men’s hockey program, guiding the Golden Bears to back-to-back Canada West championships in 2016-17 and 2017-18. Saskatoon Blades head coach Mitch Love earned his first WHL triumph on Friday as his squad edged the Swift Current Broncos by a 2-1 score at the Innovation Credit Union i-Plex. Love had previously spent seven seasons serving as an assistant coach with the Everett Silvertips. South of the border, Tri-City Americans head coach Kelly Buchberger recorded his first career WHL coaching victory following a 6-1 defeat of the Spokane Chiefs on Saturday. Buchberger joined the Americans following 10 years in various assistant coaching and player development roles at the NHL level. 12. Of 22 games to date, only one required any form of extra time, with 21 games being decided in regulation. The lone contest that needed more than 60 minutes saw the Victoria Royals sneak past the Prince George Cougars courtesy a 2-1 shootout victory. Veteran Dino Kambeitz scored the shootout-deciding goal on Friday at the Save-On-Foods Memorial Arena in Victoria. 13. Only one WHL player has received multiple first star recognition to this point in the 2018-19 WHL Regular Season. That man? None other than goaltender David Tendeck of the Vancouver Giants. The Arizona Coyotes prospect started the season in shining fashion, notching back-to-back wins over the Everett Silvertips on Friday and Saturday. In total, the product of North Vancouver has made 57 saves on 59 shots through two contests, good for a 1.00 goals-against average and .966 save percentage. 14. Through 22 contests, home teams have won 13 games to start the 2018-19 WHL Regular Season, good enough for 59.1 per cent of outings. 15. The Edmonton Oil Kings snapped a 12-game winless streak against the Medicine Hat Tigers, collecting a 3-2 win on Wednesday night. In Wednesday’s outing, Brett Kemp scored twice while 2019 NHL Draft prospect Matthew Robertson tallied an assist. Goaltender Dylan Myskiw made 33 saves between the pipes. The last time the Oil Kings defeated the Tigers came back on Tuesday, March 22, 2016. For those who remember, that game was not on the regular season schedule and it wasn’t on the playoff schedule either. That year, the Oil Kings and Tigers tied for the final wild card position in the WHL’s Eastern Conference, leading to a one-game tiebreaker game. It was 1995-born Luke Bertolucci registering two goals in the contest, while forward Tyler Robertson – the older brother of young Matthew – had two assists. In net, it was 1995-born Payton Lee turning aside 39 pucks to earn the victory. After advancing from the tiebreaker game, the 2016 Oil Kings put an early scare into the Brandon Wheat Kings during the first round of the 2016 WHL Playoffs. Ultimately though, the Wheat Kings advanced past Edmonton in six games before going on to win the 2016 WHL Championship. 16. Over the course of the first 22 games, the team that scored first won on 15 occasions, or 68.2 per cent of the time. Nothing quite like getting out of the gate early. 17. The kids are alright. Two rookies recorded multi-goal games over the course of the first week of the 2018-19 WHL Regular Season. In Portland, it was Winnipeg product Seth Jarvis registering two goals on Saturday, September 22 in a 5-3 loss at Seattle. Jarvis, the 11th overall selection from the 2017 WHL Bantam Draft, stands 5-foot-9 and 164 pounds. But boy, can the kid fly. In Cranbrook, it was Wainwright, Alta. product Connor McClennon securing two tallies on Saturday, September 22 as the ICE knocked off the Calgary Hitmen by a 5-3 score. McClennon, the second overall selection at the 2017 WHL Bantam Draft, stands 5-foot-8 and 151 pounds. Who ever said you have to be big to be good? 18. Former Portland Winterhawks defenceman Henri Jokiharju seems to have made the grade in Chicago. A first-round selection (29th) of the Blackhawks at the 2017 NHL Draft, the product of Oulu, Finland, enjoyed two outstanding campaigns with the Winterhawks, in which he collected 119 points (21G-98A) in 134 WHL regular season games. With Duncan Keith and Brent Seabrook, a pair of WHL Alumni, rooted firmly atop the Blackhawks depth chart, that leaves Jokiharju to battle for minutes amidst a relatively inexperienced Chicago blueline. Former Regina Pats defenceman Brandon Davidson is the most experience beyond Keith and Seabrook, with 207 games of NHL experience. With all that in mind folks may see the mobile rearguard make a serious splash in 2018-19. 19. Meanwhile, another former WHL star is making a strong case to crack the Calgary Flames roster. Dillon Dube, who captained Canada to gold at the 2018 IIHF World Junior Championship and registered an outstanding 232 points (101G-131A) in 203 career WHL regular season contests, has been turning heads through NHL preseason play. With six points (4G-2A) in five contests, Dube is among the NHL’s top goal scorers and leads the Flames in scoring to this point in the preseason as he heads into his first professional campaign. Dillon Dube is making a strong case to crack the #Flames' opening night roster. 20. Up the highway from Calgary, WHL Alumni Ty Rattie and Kailer Yamamoto are doing their best to impress in Edmonton. Rattie, who racked up 348 points (151G-197A) in 269 career WHL games with the Portland Winterhawks, has found himself a home atop the Oilers top line alongside Connor McDavid. The product of Calgary leads the NHL in preseason scoring, having tallied 10 points (7G-3A) in only three games. Yamamoto, a first-round selection (22nd) of the Oilers in 2017, is proving effective as well. With seven points (4G-3A) in four games, the former Spokane Chiefs standout is making a strong case to stay with the Oilers in 2018-19 after receiving a nine-game extended stay in 2017-18.